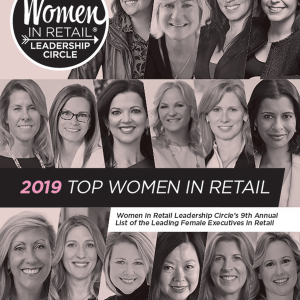 Women In Retail Leadership Circle | The 2019 Top Women in Retail List is Out! The 2019 Top Women in Retail List is Out! I’m really excited today! Why? Because the Women in Retail Leadership Circle (WIRLC) is announcing the release of its ninth annual list of the Top Women in Retail! Honorees, some of whom were recommended via a survey of our WIRLC members and Inner Circle e-newsletter readers, were chosen based on several criteria, including position within their retail organization, scope of responsibility within that position, career achievements and involvement within the retail industry. Neela Montgomery, Chief Executive Officer, Crate & Barrel Holdings, Inc.
As you can see, the list is a who’s who in the industry! The 2019 Top Women in Retail supplement features exclusive interviews with all honorees, so readers can learn everything about them, from what characterizes their leadership style to whom they turn to for advice to the latest retail technology trends they’re tracking. It’s an introspective look at some of the brightest minds in the retail industry. The 2019 Top Women in Retail list can be downloaded for free here. Many of this year’s honorees will be honored at the Women in Retail Leadership Circle’s sixth annual Women in Retail Leadership Summit, taking place April 29-May 1 at the Ritz-Carlton Key Biscayne, Miami. The Summit will host 350-plus leading women retail executives for two-and-a-half days, with content focused on business strategy and executive professional development. To register for the Summit (there are only 3o seats left), please click here! Getting to Know Shelley Broader, Chico’s New CEO and President Happy First Day of Summer! Get Ready for Girl Talks! Welcome to 2018!